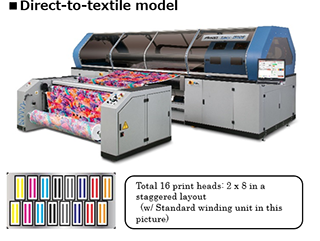 Mimaki Engineering Co., Ltd. (Mimaki), Headquartered in Nagano Prefecture, Tomi City; President Kazuaki IKEDA announced today the Tiger-1800B MkII to be launched in July 2018, as the successor to the company's previous Belt-Type Inkjet High-Speed range Model, the Tiger-1800B released in September 2016. The Tiger-1800B MkII is a high speed-range model in pursuit of the print speed and high quality, based on the enhanced stability and high accuracy of print technology. 1. Direct print model with 16 print heads (2 lines of 8 print heads in a staggered layout). 2. 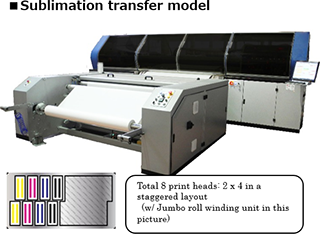 Transfer sublimation model with 8 print heads (2 lines of 4 print heads in a staggered layout). With the achievement of a maximum print speed of 385 sqm/h *1 for both models, the Tiger-1800B MkII can cover a wide production range from sample making to small/medium volume printing. An additional new print mode by 1200 dpi is enhancing print quality and the MAPS *2 is an added function for a high quality as well as high-speed printing. In general, the boundaries of multiple passes to be a line can cause of banding and color shifting when there is just a small gap while printing. MAPS will disperse the edge of each pass to make boundaries look like gradations, eliminating banding and color shifting. To maintain high productivity, another function, the NRS (=Nozzle Recovery System *3), allows printing to continue using good nozzles as substitutes, when clogged nozzles cannot be recovered. The Tiger-1800B MkII offers outstanding design technology to enhance and maintain stable high-speed printing. 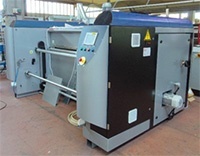 Ideal production system can be arranged with enhanced feeding and winding units (for storage after printing) depending on the details of the work and the customers installation environment. 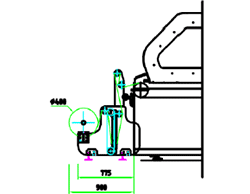 Printing by single pass may cause a subtle difference of dot diameter or a gap of droplet landing position as it is to be printed by one time for a specified printing area. The caused gap will appear as stripe and band to be quality degradation. 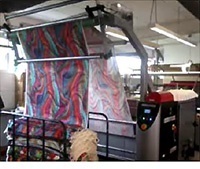 However, the multi-pass means to print a determined printing area by multiple times with different nozzles, which allows to suppress the cause of stripe and band and create a beautiful print. The Tiger-1800B MkII will apply the production from the high-speed print regarding much importance for productivity to the high-quality print of beautiful image. *4: MAPS is not available for 1Pass print mode. *5: NRS is to be applied later. Depending on a print mode, the NRS may not be available. 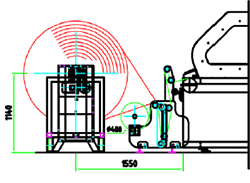 *7: It is the value when the standard unit (option) is attached to Feeding/Winding unit of each. 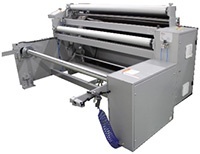 *8: It is the value when the jumbo roll unit (option) is attached to Feeding/Winding unit of each. The Tiger-1800B MkII will be displayed at the Mimaki Stand (#: 1.2- D20-D30) of the FESPA Global Print Expo 2018.